Through the election season, many of the candidates spoke of personal stories. “I spoke with a hardware store owner in Mississippi…” “After speaking with a single mother of 8, I learned…” “After telling my 26 year old cashier that I would like the paper bags…” I think in honoring this vein I would like to relay one simple story of a letter that I received in the mail concerning the election. “Dear Messy Chef…” the letter began. Dated October 31, 2012. Simple enough. Friendly, polite, and written in an enjoyable font. I am betting it was Calibri, size 12. If the Cowboys are America’s team, Calibri may be America’s font. In fact, Calibri overtook Times New Roman as the standard font in Microsoft Word in 2007. Hold up a minute. I definitely voted in 2008. 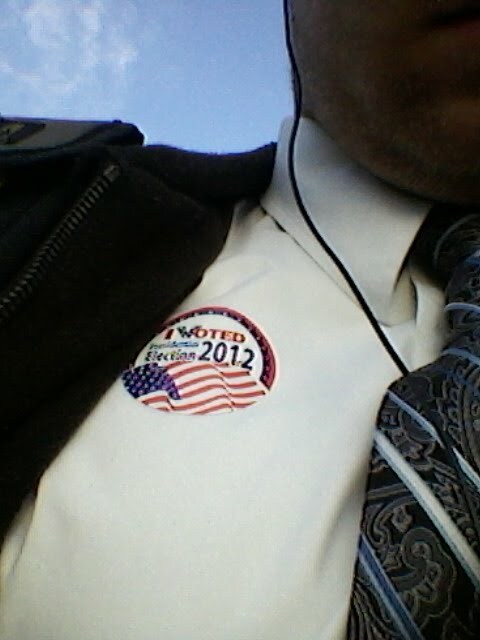 Submitted an absentee ballot and mailed it away with pride. However, I had moved states so maybe they were looking at a different Messy Chef. I know from walking through people’s kitchens that there are plenty of Messy Chefs. In any event, I knew that I had planned to vote for this year and continued to read the letter. “This election is important, and who shows up to vote will decide who represents us in Washington.” I should have stopped reading at this point. The word “us” clung to me and I reread the sentence. Reread it with me now, “This election is important, and who shows up to vote will decide who represents US in Washington.” What on earth did that mean? 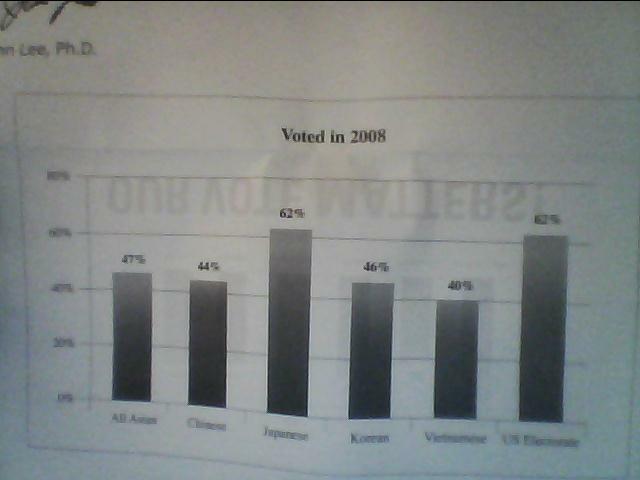 While this is an important message and I do hope that WE improved our percentage of Asian voters, I am not sure my vote on Election Tuesday helped change those percentages in any way seeing as I am not Asian, although I do enjoy mochi as much as the next person. Who can argue with that kind of deliciousness in such the perfect amount of porton?! “We will be calling some of you after this election so we can thank you for voting.” My phone is fully charged waiting for that conversation. 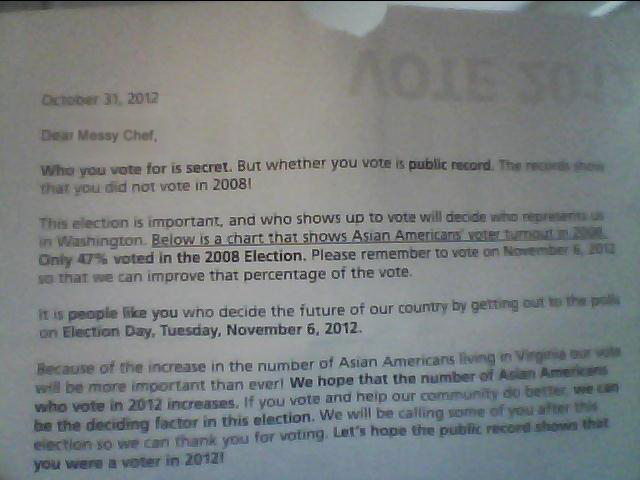 “Let’s hope the public record shows that you were a voter in 2012!” It should. I hope it also shows that I am not Asian otherwise my parents have a lot of explaining to do. Hope you all voted in the election. No matter whether your candidate won or did not win, we still got a game to go out and play and winning has never been more important. U- S- A! U- S- A! U- S- A! Hmmm… that chant always seemed more momentous when shouted by a stadium full of people than it does typed at the end of an obscure blog… U- S- A!